I saw yesterday morning that Shawn at Miles to Memories had taken a crack at comparing the much-beloved Club Carlson rewards program with the just-announced changes to the Wyndham Rewards program, effective May 11, 2015. There are many methods of comparing co-branded hotel credit cards. Personally, I prefer using a metric I call "imputed redemption values:" the amount of cash back foregone by using a hotel's co-branded credit card instead of a 2% or 2.22% cash back card. 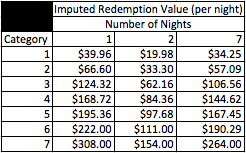 The method isn't perfect (it ignores points earned on paid stays and elite-qualifying nights and stays) but it has two key benefits: it makes co-branded hotel credit cards directly comparable; and it gives a rough guideline for how much your typical room redemptions should cost to make hotel points worth manufacturing at the expense of cash back. This chart illustrates the decreasing impact of the last-night-free benefit on longer stays. A glance at the charts shows that, unsurprisingly, It's still true that if you're staying exactly two nights somewhere with a Club Carlson property where you'll be happy staying, those two nights will always be cheaper if manufactured with a Club Carlson credit card than with a Wyndham Rewards credit card (or any other hotel's co-branded credit card). But if you're staying a single night, your last-night-free benefit is worthless. 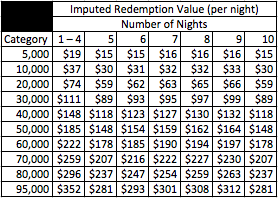 If you're staying more than 2 nights, and especially if you don't have a second Club Carlson account you can use to book alternating pairs of nights, the last-night-free benefit rapidly loses value. This works in two different ways. First, Club Carlson and Wyndham properties are located in different places. If you want to stay where a Wyndham property is located, you need to use Wyndham points or cash. If you want to stay where the Club Carlson property is located, you need to use Club Carlson points or cash. Second, the distribution of properties within category bands is different. In a city with exclusively high-category Club Carlson properties, Wyndham stays are more likely to be cheaper (except on two-night stays, as mentioned above), while areas with low-category Club Carlson properties will have relatively expensive Wyndham properties. The important thing to note here is that these distributions are not random. It is knowable (or at least predictable) in advance whether you're going to be visiting areas with relatively expensive or relatively cheap Wyndham properties (for example by looking at your travel pattern for the previous few years). In other words, you don't need to decide between Club Carlson and Wyndham in a vacuum: you can make an educated guess about how well each program will work for you based on your actual and planned travel. I'm checking in for a 2-night Club Carlson stay this afternoon. A few days ago I checked out of another 2-night Club Carlson stay. I had a 2-night Club Carlson stay in Rome in January. Last year I had several 2-night Club Carlson stays in New York City. Suffice it to say, I love Club Carlson's program, and I love the last-night-free benefit. With that out of the way, let's be honest: Club Carlson properties can be pretty terrible. The Radisson Blu in Rome has a great location right by the train station and a great breakfast buffet, and it costs just 44,000 Gold Points per 2-night stay (about $98 in foregone cash back per night). But I'll never stay there again; it's a dump. Of course, readers have also shared wonderful experiences at various Club Carlson properties. The point is simply that locking yourself into Club Carlson because it's the "best" rewards program requires you to be indifferent to the quality of the properties themselves. 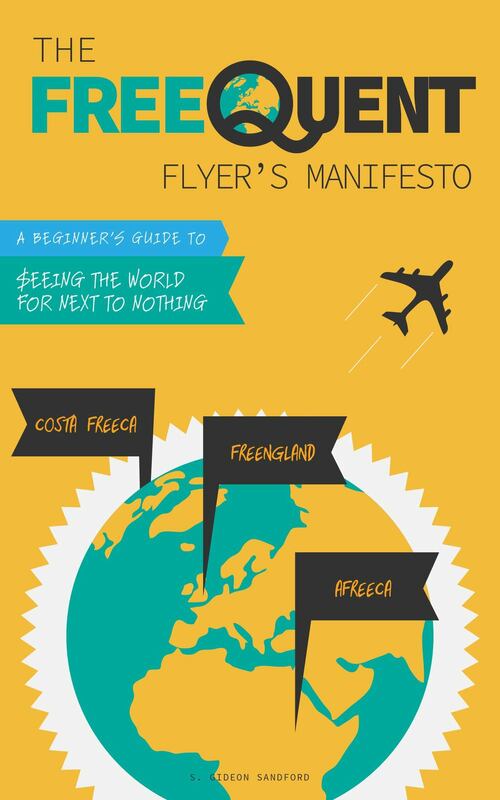 As travel hackers, we can hold ourselves to (at least slightly) higher standards than that! The Wyndham Rewards co-branded credit card paired with the May 11, 2015, revaluation of the Wyndham Rewards program will make Wyndham Rewards stays in areas with high-category properties in other chains the cheapest or second-cheapest to manufacture, depending on the length of your stay. However, whether it makes sense to prospectively manufacture large numbers of Wyndham Rewards points will still depend entirely on the distribution and quality of Wyndham and other hotel properties in the areas you actually intend to visit.